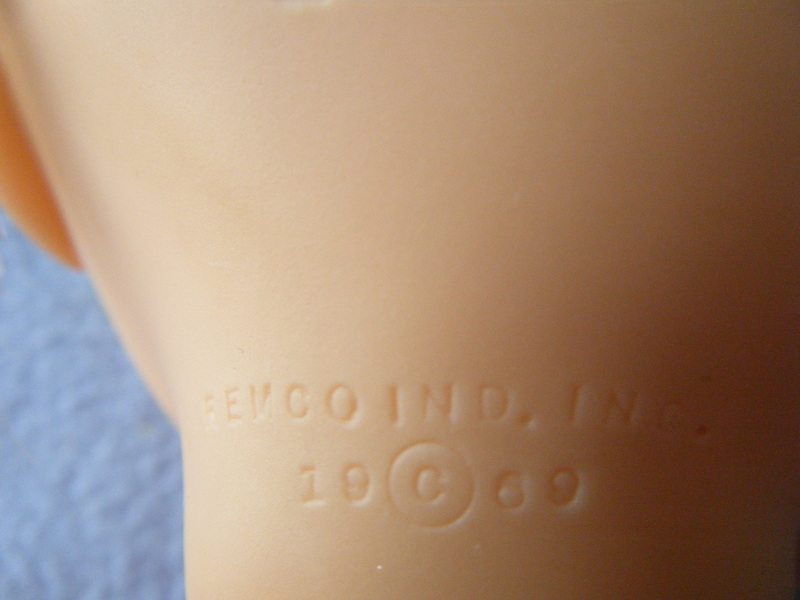 Baby Know It All is a Remco doll first produced in 1969. 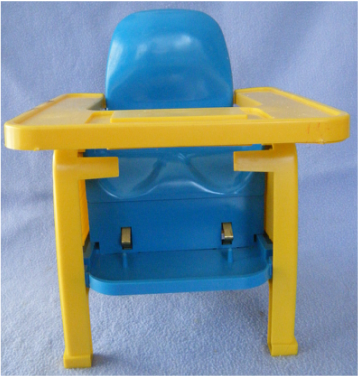 This doll sits in a feeding chair and will either jump up and down or shake her head when various pictures, in a slotted tray, are placed in front of her. This magic is accomplished through the use of a pair of magnetically activated switches hidden in the feeding chair's tray. An interesting feature of this doll is that her batteries are located in the chair. Her internal electro-mechanical system is powered through electrical contacts on her heels touching contacts in the footrest portion of the chair. Without the chair, the doll is pretty much useless. Even though the doll came without the magnetic picture frame, we were able to get her to work by using handheld magnets. Her motor was seized up and required clock oil lubrication and some finger spinning to get started. She runs on 4 D cells - providing both negative 3 volts for shaking her head "no" and a positive 6 volts for making her jump up and down. She is pretty finicky and needs to be seated with a vertical posture to operate properly. Even then she may need to be nudged a little to switch between jumping and nodding. The feeding chair seems a little like an electric chair. The doll fits into a formed seat and needs to have her feet positioned over plastic pins so that her heels make electrical contact. 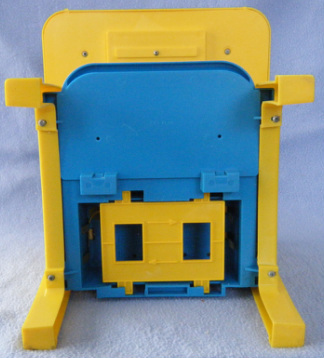 This photo turned out to be helpful - the chair sort of fell apart during the disassembly process and I couldn't remember whether the blue tab on the lower piece went inside or outside. I really like the battery compartment cover. It lets you see if there are batteries in the unit and is slide in/slide out - no screws or formed tabs susceptible to fatigue breaks. The doll's feet have holes in the bottom and metal bands on the heels. 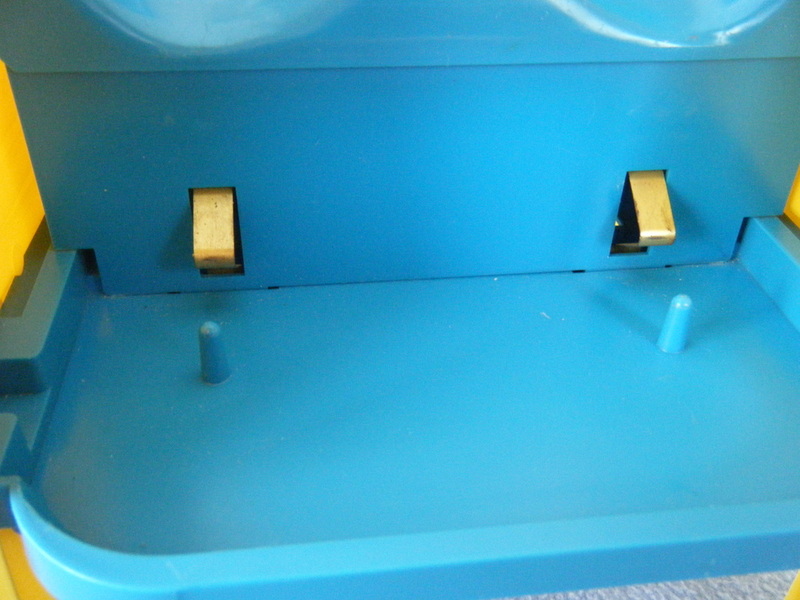 The holes go over the blue locating pins in the chair's footrest. The heels make contact with the brass tabs. Electrical current is supplied to the doll's motor through her heels. This is an upside-down view of the underside of the chair's arm. The purpose of the large hole at the right end is unclear. I actually think it was originally intended to be routing hole for the bundle of wires that go to the tray. To save wire, or to prevent exposing wires to the user, the wires were routed inside the arm instead. 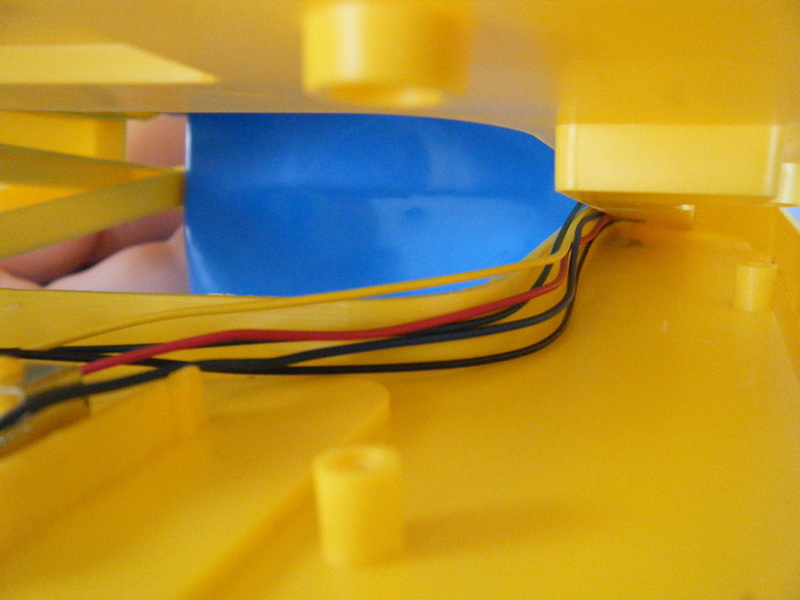 The wires were a bit pinched with alternative routing and were held in place with a putty-like material. 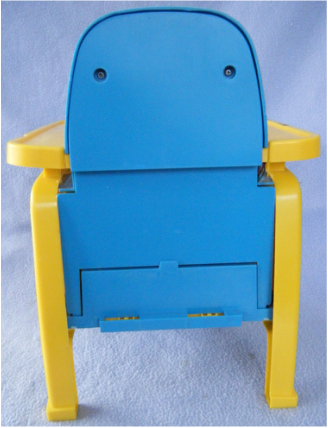 Side view of the feeding chair. The doll's hands run along the chair's arms when she is jumping up and down. Top view. Notice the form-fitted seat. 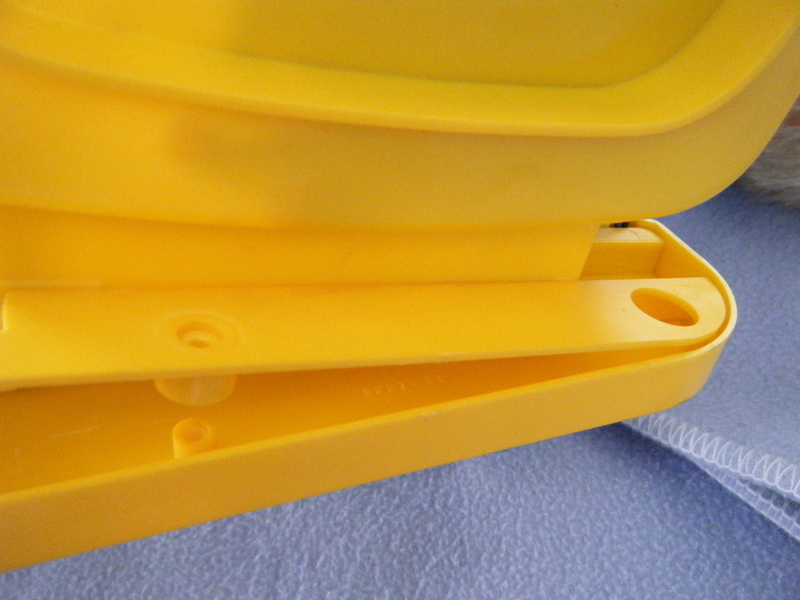 The tray has the ovalish track to hold the card accessory. It needs to be positioned exactly in order for the magnetic switches to be activated. This doll is unusual in that she runs on 4 D cells. No corrosion to deal with this time! When I couldn't get the doll to operate, I opened up the chair to check for continuity throughout the wiring paths. I was amazed at the amount of wiring I found. I also discovered a interesting manufacturing method. The wires are not connected with solder. Instead, their stripped ends are placed inside the blue posts and conical brass fittings are pressed into place. Instant connectivity that is easy to repair! 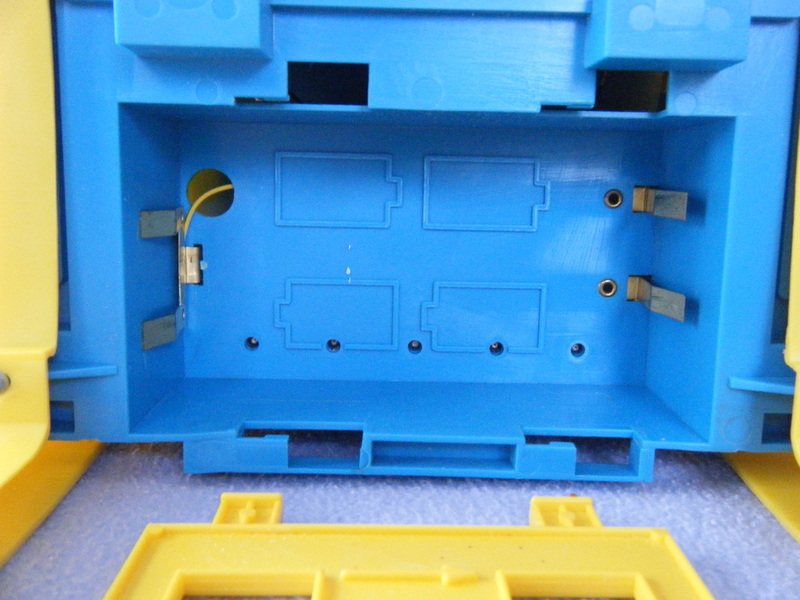 This shows the wire bundle going to the magnetic switches in the tray. The wires were pinched but fine. This is the ingenious switching system that determines if the doll jumps up and down or shakes her head. The two black rings are permanent magnets. They have brass washers on either end. 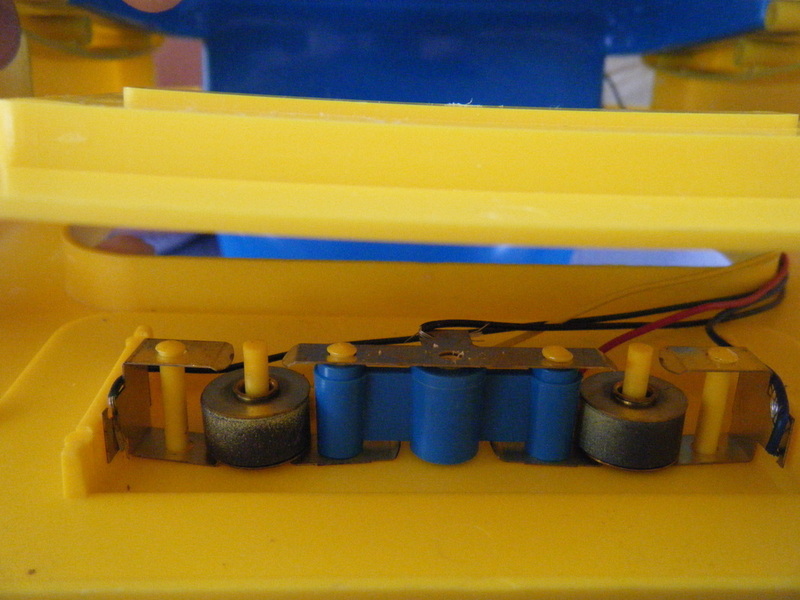 When both magnets are resting on the bottom of the tray (as they are here) the circuit is open and no current flows to the doll. 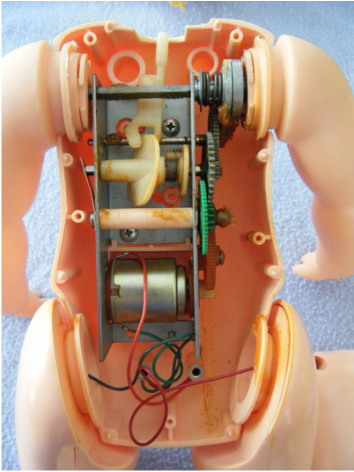 When a magnet of the correct polarity is positioned above just one of the internal magnets, it rises up, makes contact and closes the circuit - allowing the doll to perform her jumping action. When the magnet is moved over to the other internal magnet, it lifts up, creates a new contact that initiates the head shaking action. In actual practice, the doll's card holder had flipped polarity magnets located over the internal magnets. This would guarantee that one switch was always up and the other switch always down. The somewhat dirty face of Baby Know It All. This doll has specialized feet. The holes in the soles of her shoes are to locate her feet in the feeding chair. 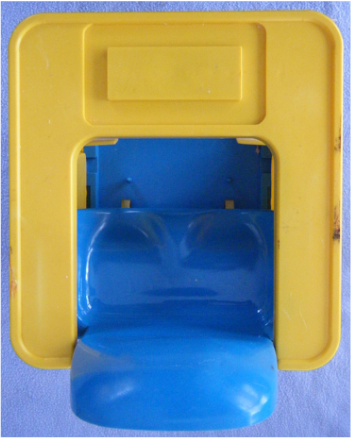 The metal strips in the heels are the contacts connecting the batteries in the chair to the motor in the doll. 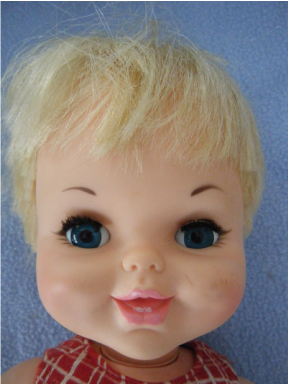 Baby Grow-A-Tooth is the only other doll that I have seen that uses the heel contacts (but no sole holes). 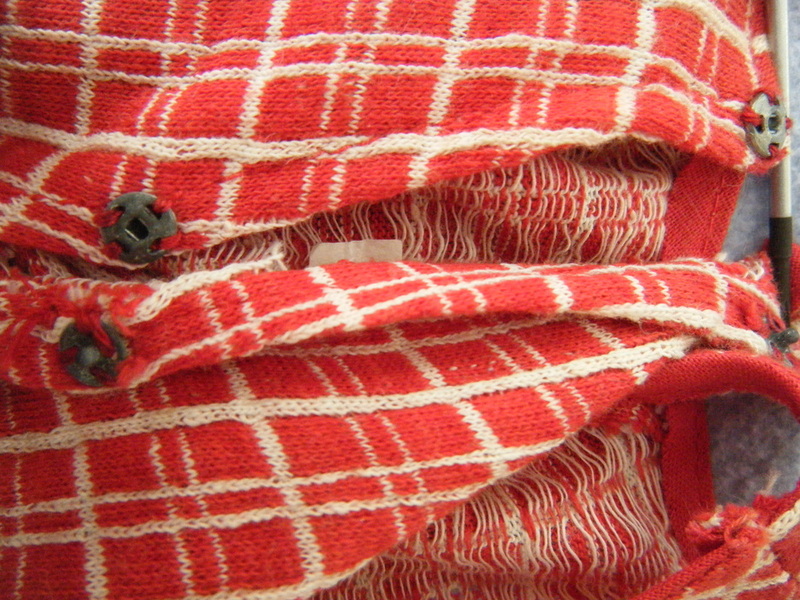 The outfit is not well aligned along the center seam. Dolls were pretty global even in the mid 1900's. Even though jointed, the hips and knees on this doll are not powered. Her jumping up and down action actually comes from her arms rotating forward and backward making her rise up as they glide along the edges of the feeding tray. 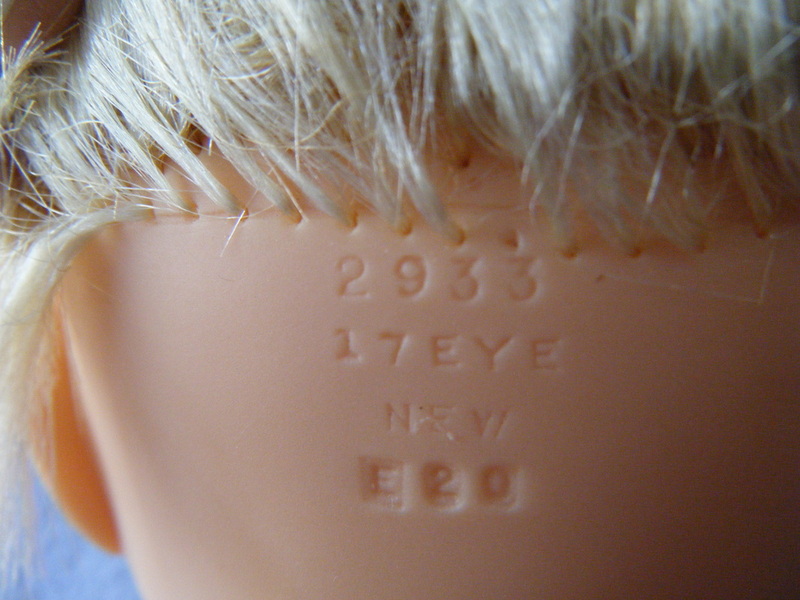 The manufacturer's marks under the hairline. Can't say this is my favorite outfit - too gaudy. This outfit uses snaps and pre-dates the invention of velcro fasteners. 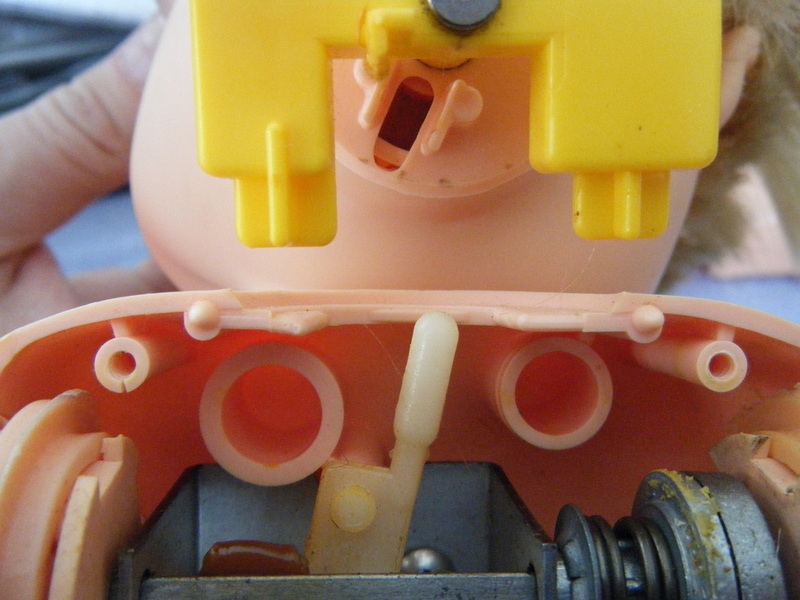 While dolls with screw holes may seem less attractive, they are far easier to repair than dolls that are glued together. 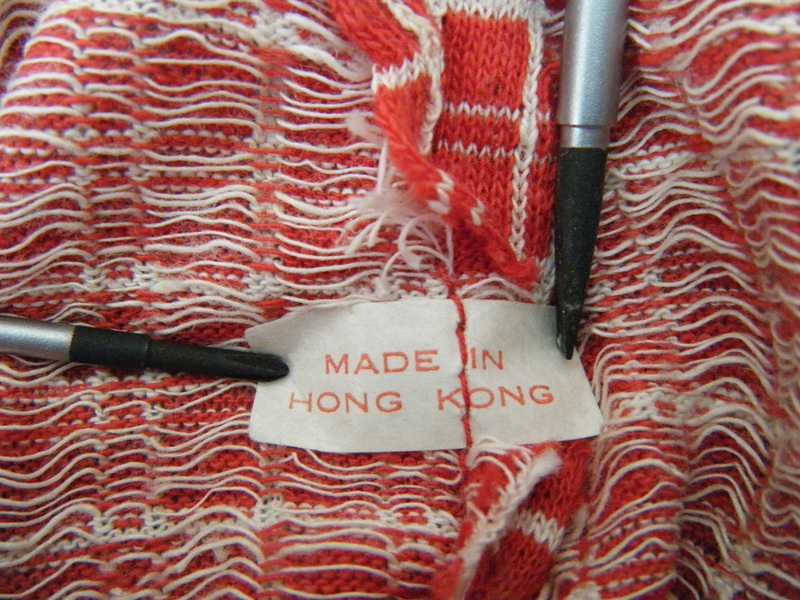 The manufacturer's marks at the base of the neck. This doll has a really unusual neck mechanism because she has to shake her head vigorously when she "sees" something she doesn't like on her feeding tray. 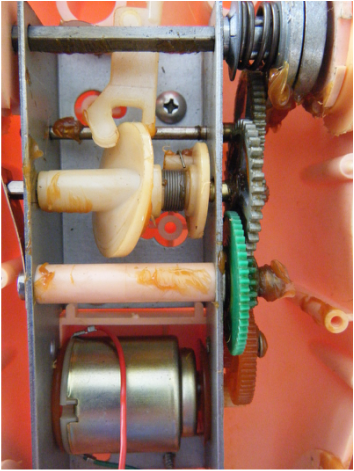 Here is a good view of the gear train inside the doll. When the motor spins in one direction the right arm receives power and raises the doll up and down. When the motor spins in the opposite direction a slip clutch engages and the white cam rotates causing the doll to shake her head back and forth. 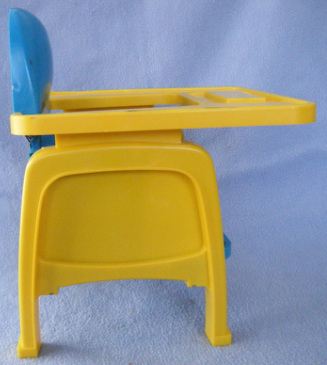 The direction that the motor spins is determined by the up and down positions of the magnetic switches in the feeding chair's tray. 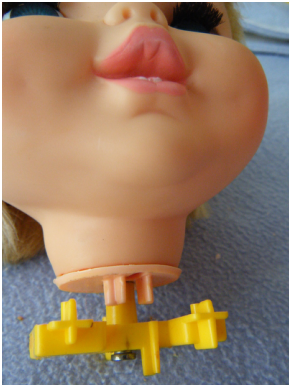 The doll's neck is designed so that it can't be assembled wrong. The cross shaped tabs are different diameters and can only go in the right sized holes in the doll body. The white finger-like piece inserts into the oval hole in the underside of the head. A cam drives the finger-like piece back and forth causing the head to shake from side to side. 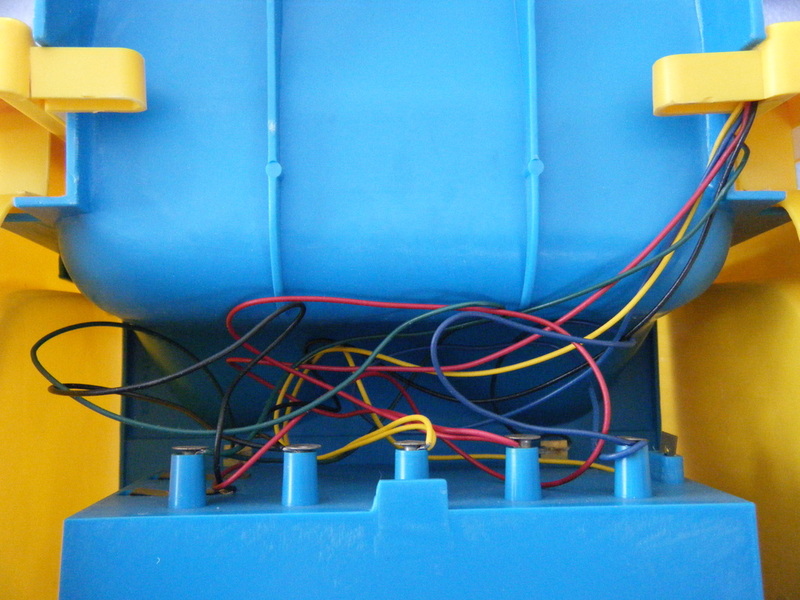 This whole body shot shows the quick connects for the wires entering the body from the legs.